Insular Dwarfism and Gigantism: Why did mammoths and mastodons really disappear? Dinosaur went extinct some 65 million years ago. The rock layers of that time tell a story of a cosmic impact: iridium is found in a thin layer that marks the end of the Cretaceous era and the beginning of the Tertiary era. Which is why scientists call the event Cretaceous-Tertiary (or K-Pg). But it wasn't only iridium that was found in that layer, a similar anomaly was the presence of platinum. Both anomalies represent the atmospheric fallout of rare elements resulting from an extraterrestrial impact. 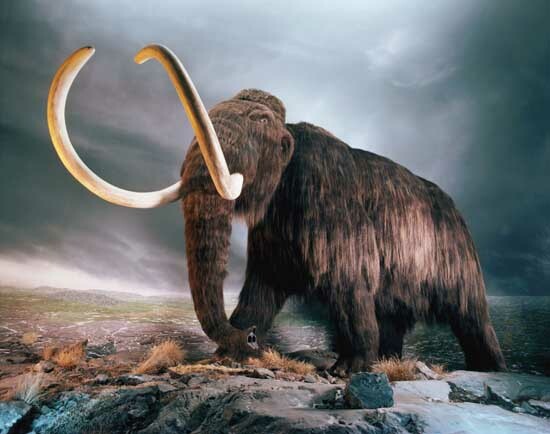 Around 12,800 years ago, the mammoth, mastodon and saber-toothed tiger suddenly disappeared. This was the onset of the Younger-Dryas. Although early humans are blamed, nobody knows for certain what the exact cause of the extinction was. The discovery of widespread platinum at archaeological sites across the United States has provided an important clue in solving this enduring mystery. “Platinum is very rare in the Earth’s crust, but it is common in asteroids and comets,” says Christopher Moore, the study’s lead author. He says the K-Pg dinosaur extinction was the result of a very large asteroid impact, while the Younger-Dryas onset impact is likely the result of being hit by fragments of a much smaller sized comet or asteroid, possibly measuring up to a kilometer in diameter. The Younger-Dryas impact event is not yet associated with any known impact crater. He says the Younger-Dryas coincides with the end of the Clovis paleoindian culture and the extinction of more than 35 species of ice-age animals. Moore says that, while evidence has shown that some of the animals were on the decline before Younger-Dryas, virtually none are found after it. Moore thinks that this would indicate an extinction event for North America. Current views tell us that the mastodon became extinct in the New World 130,000 years ago, but recently the bones of a mastodon were found under a freeway construction site in California. These bones were battered and broken by modern humans. The problem is that Homo sapiens reached North America only about 15,000 years ago. So, you see, there's a problem. Scientists now speculate about a radical new early date for the arrival of ancient humans in America. The problem can more easily be solved by stating that mastodons were still alive around 15,000 years ago. Holen et al: A 130,000-year-old archaeological site in southern California, USA in Science - 2017. See here.